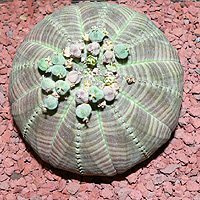 One of the more fascinating of the genus is Euphorbia obesa, looking a little like a round sea urchin with intricate patterns it will grow taller and will flower. It is also said look a little like a baseball, round and with stitching, however it is originally from South Africa this is a slow growing species but is very long lived. Grown mainly in containers as a house plant it is a plant that requires lots of light and warmth. In its natural habitat the plant is rare and endangered, however in cultivation it is widely available from specialist succulent nurseries, not one you will find at the local garden centre. Mainly grown as an indoor plant, this is a species that has been sought after by plant collectors since it was first discovered in the mid 1800s. Best grown in a container using a specialist cacti and succulent potting mix. Usually grown indoors and given some time outdoors during the summer except in warm dry climates. Euphorbia obesa does not like frosts and does not like to be over watered. Many gardeners use a gravelly potting mix to ensure good drainage. The flowers are dioceious so you will need both male and female if you are to get this strange and wonderful plant to set seed. It will take 6 – 8 years to get these plants to flower from seed, so be patient. Well drained specialist succulent potting mix. Water every 2 – 3 months with a deep soaking.